NCYI accuses State Department of breaching 1995 Jerusalem Embassy Act and Kerry's senate position by criticizing building plans. The National Council of Young Israel (NCYI) has fired back at the State Department for its criticism of Israel's announced building plans for Jerusalem, which would see over 500 housing units made available for Jews in the eastern part of the capital. NCYI argued Israel has a right to build housing for its citizens, a right particularly important given the ongoing housing crisis. "With its religious, historical, and cultural significance to the Jewish people, the importance of Jerusalem's status as the eternal capital of Israel cannot be overstated," said NCYI President Farley Weiss last Friday. "The State of Israel has a legal and historical right to construct new housing units within the confines of its capital city." Weiss noted he was troubled by the State Department criticism, saying its "position runs counter to the provisions of the Jerusalem Embassy Act of 1995, which makes clear that it is US law that a united Jerusalem is recognized as the capital of Israel, and called for the moving of the US Embassy to Jerusalem." Given the existing legislation, Weiss points out the State Department is opposing US law. He adds that ironically, US Secretary of State John Kerry voted for the Jerusalem Embassy Act as a senator, and signed a letter urging then-President Bill Clinton to comply with the act and move the embassy. "We urge Secretary Kerry to be consistent with his record as a Senator and to strongly defend Israel’s right to build and the sovereignty of its capital city, Jerusalem," remarked Weiss. NCYI went on to note that US President Barack Obama campaigned at the Democratic Convention, pledging that his party's platform would support Jerusalem as the undivided capital of Israel, a position contradicted by the recent State Department criticism. "We call on the State Department to retract their criticism of Israel and comply with US law concerning recognizing Jerusalem as the capital of Israel,” concluded the NCYI statement. As noted, the State Department struck out against Israel's construction plans, with spokesperson Jen Psaki saying last Thursday "we oppose any unilateral actions by either party that attempt to prejudge final status issues, including the status of Jerusalem." Those criticisms were echoed by European Union (EU) Foreign Affairs Commissioner Catherine Ashton, who said last Thursday the construction plans "endanger the chances of turning Jerusalem into the capital of two countries," referencing the proposals for an Arab capital in Jerusalem. The international support for an Arab land-grab on Jerusalem was seized upon by the Palestinian Authority (PA); this week the PA revealed it is demanding authority over all of Jerusalem's Old City, including the Kotel (Western Wall), in addition to all parts of the city over the 1949 Armistice lines. 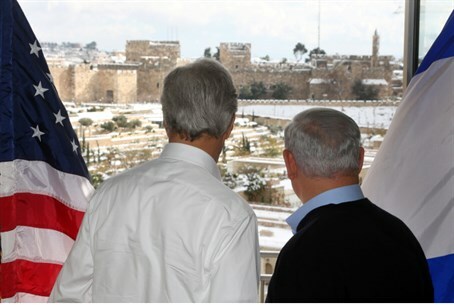 Kerry has been criticized for his pushing of Israel to accept the proposals, which aside from dividing Jerusalem would have Israel withdraw to the 1949 Armistice lines nation-wide. In order to force through his plans, Kerry threatened Israel with international boycotts in early February, a threat made more concerning by reports Kerry himself is orchestrating European boycotts.